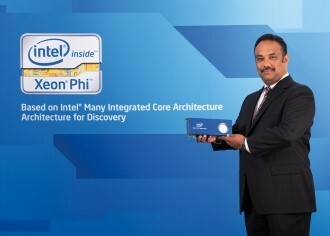 The latest Intel Xeon Phi chip has arrived, packing a full 60 cores into a single package. It’s not expected to be publically available until sometime early next year although a few have been granted early access to the technology that’s said to be more like a GPU than a traditional CPU. Intel announced Xeon Phi as the new name for all of their future Many Integrated Core Architecture (MIC Architecture) earlier this year. The coprocessor is built using Intel’s 22nm 3D Tri-Gate transistor technology much like Ivy Bridge consumer products. Xeon Phi, however, certainly isn’t a consumer-grade chip. Codenamed Knights Corner, the chip works inside of servers and supercomputers alongside the regular CPU(s) to boost calculations used for mathematics, graphical tasks and scientific experiments. The high-end chip in the 3100 family is capable of churning out more than a teraflop of performance per second. Traditional desktop processors don’t even come close to that. Cambridge University and Stephen Hawking have been given early access to the chip, according to Intel. It is being used in their SGI UV2000 supercomputer. Hawking said in a statement that the chip gives them the ability to focus on discovery and continue to lead the worldwide efforts to advance the understandings of our universe. The general public will be able to get their hands on the coprocessor early next year; January 28, to be exact. We are told that it’ll ship on a PCIe circuit board and carry a MSRP of $2,649.